Last night's storms packed quite a punch. The rain, wind and lightning left a lot of damage. In one area, the storm ripped up trees right from the ground. Imagine rushing out to start your work commute, only to find your car crushed beneath a fallen tree. It happened to one vehicle owner in the Heights. "I have been a bit concerned about all the water we have had," said Heights resident Jon Fontenot. "I know that the land is a bit waterlogged at this point. We have a lot of old trees here. The tree that feell had already been leaning, pulling it up from the sidewalk. All it took was one more thunderstorm for it to come tumbling down. "The water just gave way to the roots and here it is," said Fontenot. "I feel bad for the person who parked the car there though.". Crews spent the morning cutting electricity to make sure the power lines were safe to deal with while trimming the tree. In Huntsville, the Sam Houston State University took on water in many of its buildings, and a wall at a campus rec center collapsed as a result. "We just heard this break then you just heard yelling and you're like, 'What is going on?'" Said Katie Chapman, a senior from Brenham. The rec center will be closed indefinitely. All classes will be held as usual, according to Julia May, Associate Director in the Office of Communications. Rosenberg is another area hit hard by the severe storms. Police there say there are various reports of downed power lines and street light outages. 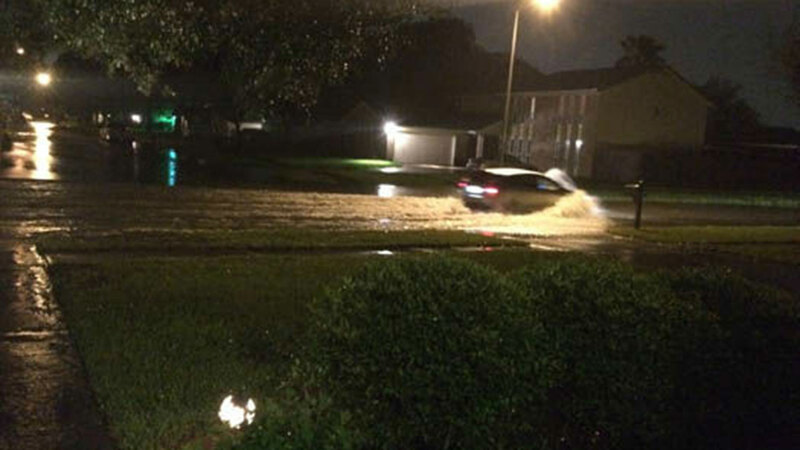 No reports of injuries have been made, but the Fort Bend County Sheriff's Office says it received reports of high water along Highway 59 in the area. In The Woodlands, homeowner Jason Cardenas has a huge hole in his roof from a fallen tree. "The next thing I know I heard a loud crash, some explosions popping, and the tree fell right in the dining room," Cardenas said. Cardenas says he was watching TV when he heard the winds pick up. A tree uprooted and crashed into his home on Falling Leaf. He put a tarp over the roof and will start the repair work Friday. He's just thankful no one was hurt. A few miles away, Howard Decker moved burned furniture to his driveway. He says his home was hit by lightning. "House lit up. Really white, white. And we thought our neighbors home had gotten hit because I heard their generator come on. So I was going out the garage to check on my neighbor. My garage was filled with smoke," Decker said. Decker and his wife got out safely. He says the garage is ruined, and there's smoke damage in other parts of the home. The rain should end overnight but additional storms will likely redevelop on Friday. And once again, these storms could be severe. We are expecting more weather to move through our area. A Flash Flood Warning remains effect for Harris County until 8am tomorrow morning. Got any storm photos to share? Post them to social media with #abc13eyewitness, email them to news@abc13.com or upload them directly from your ABC13 Houston Weather app.